This game is in an early-alpha state. I'm sure there are bugs in here somewhere, but the game is more-or-less stable. "Prism: The Maze Game" is a version of capture the flag played in a user-defined room. Rooms can be defined through lua using a simple API. All docs can be found in the 'README.md' file. The download includes examples and tests. Use WASD to move. Grab flags from other teams and bring them to your base. You can steal flags from other players. Shift to sprint. 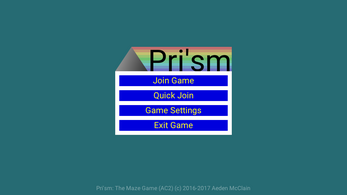 To get straight to playing the game, extract the archive and run the 'prism' executable. The default server is platypro.net, port 22133. I try to keep a server up. 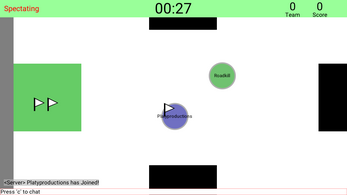 The server is set up with a timed game. At least two people are needed to play! To run your own server, run 'prisms' inside of a terminal window. More info on this can be found in the included readme. Is it reproducible, if so how?